The 1960 United States presidential election in Utah took place on November 8, 1960, as part of the 1960 United States presidential election. 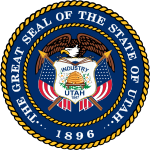 Utah voters chose four representatives, or electors, to the Electoral College, who voted for president and vice president. Utah was won by incumbent Vice President Richard Nixon (R–California), running with United States Ambassador to the United Nations Henry Cabot Lodge, Jr., with 54.81% of the popular vote, against Senator John F. Kennedy (D–Massachusetts), running with Senator Lyndon B. Johnson, with 45.17% of the popular vote. ^ "United States Presidential election of 1960 - Encyclopædia Britannica". Retrieved June 7, 2017. ^ "1960 Election for the Forty-Fourth Term (1961-65)". Retrieved June 7, 2017. ^ "1960 Presidential General Election Results - Utah". Retrieved June 7, 2017. ^ "The American Presidency Project - Election of 1960". Retrieved June 7, 2017.